Highly trained, carefully selected and certified professionals. This assures you the finest instruction in dancing. Our professionals are committed to make you feel at home on any dance floor with any partner. Simple and fun teaching methods to help you reach your goals and enjoy your dancing. Personalized one-on-one private instruction. 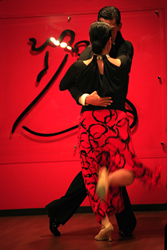 Your instructor will spend the time necessary on technique, styling and general dance improvement. Specially taylored to you that will help you achieve your goals in dancing. An up-to-date record of everything you have learned. Meet other students in the studio. Another fine way to help you become a more proficient and confident dancer. Practice parties are great to help develop confidence to move around the dance floor. Gives you the opportunity to practice and try out all the new dance skills that you've learned in your Private and Group Lessons. Learn how to deal with crowded dance floors.